Supporters of a second referendum on the UK's relationship with the European Union are hopeful of their movement gaining momentum after MPs overwhelmingly rejected Prime Minister Theresa May's divorce with the bloc. The House of Commons' 432-202 vote against May's plan was widely expected, but it was still devastating for her fragile leadership and means further turmoil for British politics only 10 weeks before the country is due to leave the EU on 29 March. 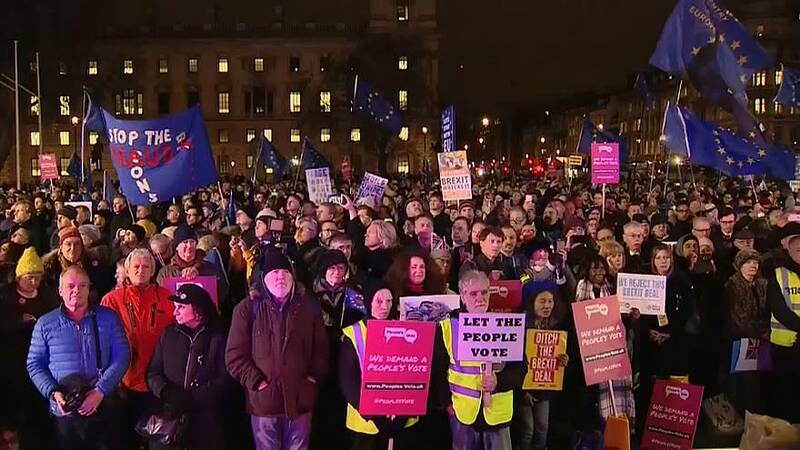 Rival groups of pro-Brexit and pro-EU demonstrators rallied outside Britain's parliament ahead of Tuesday's historic vote on a divorce deal with the European Union. Protesters seeking a new referendum on Britain's membership in the bloc waved blue-and-yellow EU flags.